A while ago I made some templates of all kinds of stepper cards ... side step - center step - double side step. And I had to wait untill my pain allowed me to make these. So I did make a few now and here they are. This card is sized 10 by 15 cm. 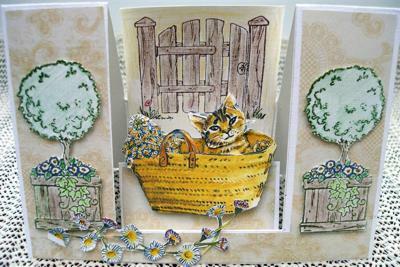 The cat in basket is a 3 D cutting file. For both the outer edges I stamped a pot with tree, 2 times, on white cardstock and cut out with scissors. 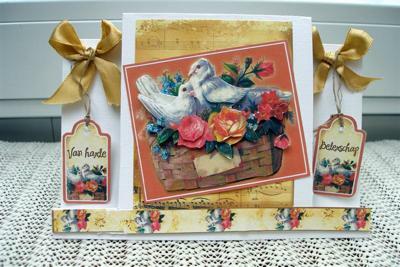 I colored them with plain pencils and attached them with glue dots to the patterned paper I had glued on my card first of course. Then I stamped the fence on a piece of white cardstock matching my inner step. I coloured the same way and glued with double sided tape on the step behind the cat. I cut out some left over flowers and attached them to the front with glue dots, to come to the fore ground. The second one is also 10 by 15 cm. Kept it simple. Musical backing paper to mat my 3 D cuttingfile. And on both sides a bow on which I tied a small tag with raffia. The third one is also 10 by 15 cm. A baby 3 D cutting file which I matted a handcut flower out of patterned paper. On every petal I put a rhinestone. The side steps are embellished with punched flowers, ribbon and small adhesives and a tag. The 3 D victorian rose I glued on patterned paper and matted on a dark pink cardstock tile which I glued on the last step. I glittered the roses with some glitterglue. The second step is punched out and I glued a butterfly on it. On the first step are my wishes in golden stickers. 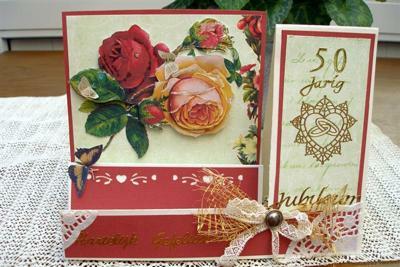 On the side panel, which is also matted with patterned paper and pink cardstock, are the golden stickers that refer to the joyous event : 50 years of marriage. On the corner where the steps begin I fastenend a golden roughly woven bow together with an offwhite lace bow with a brad. Phew ..... sorry if I've written some words wrong, but this was a quite long post for me to write lying down . Thanks again Christina for all your wonderful video's !!! These cards are all just wonderful Rosa and I appreciate every one of them. I know that it is difficult for you to write as you cannot sit or stand for very long and that makes them all doubly special. You are an inspiration with the beautiful work you produce and thank again for your submission.